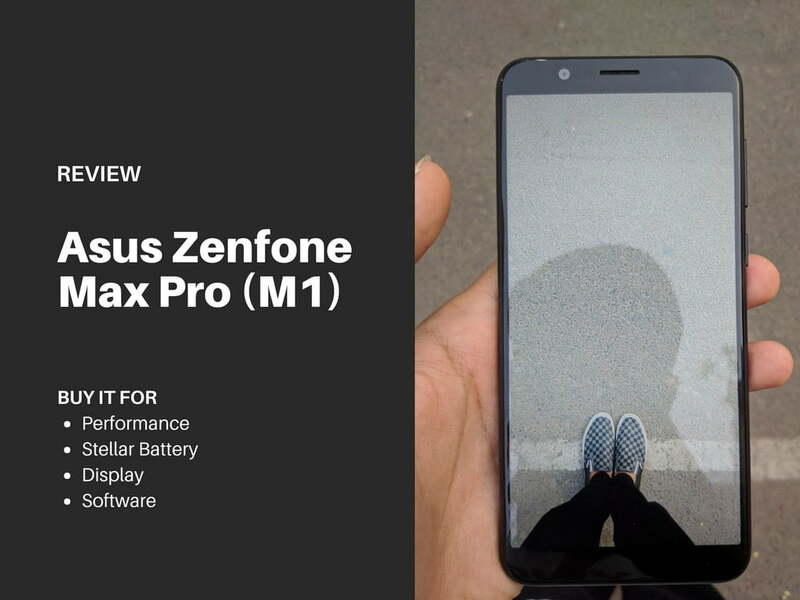 Product Description: Asus Zenfone Max Pro M1 is a device that rightly targets the mid-tier budget of Indian audience by providing in all the latest specifications one would need at that budget, powered by Stock Android! Asus has been working quite hard to get into the Smartphone industry for a few years now. Even though they have been quite successful with devices like Zenfone 4, 5 and 6, they were targeted at a budget which didn’t have quite a big market share in India! This time, they’ve taken a path of entering into Budget segment against competitors like Xiaomi and Motorola. Let’s deep dive into our review on Asus Zenfone Max Pro M1. Asus Max Pro M1 has got this design. The volume rockers and power button are on the right, with nothing except the SIM and microSD card tray on the left. Unfortunately, Asus Max Pro M1 has nothing new to offer in the design part. It follows the same aesthetics that many other companies have been doing for years! I would like to point out the phone has a weight of 180g due to a 5000mAh battery inside. The device comes in 2 different colors : Grey and Midnight Black. The device has an all-metal (aluminium) body, which makes it feel really good in the hand and is definitely built to last. Asus claims it has a “High-quality durable glass”. But there’s no clarity if the phone uses a Corning Gorilla Glass or not, and I personally feel it doesn’t. It is slippery as well. I would definitely suggest you to buy a Protective Case and a Tempered Glass, just to stay on the safer side. Overall, the device has a premium build quality and feels slick when in hand. 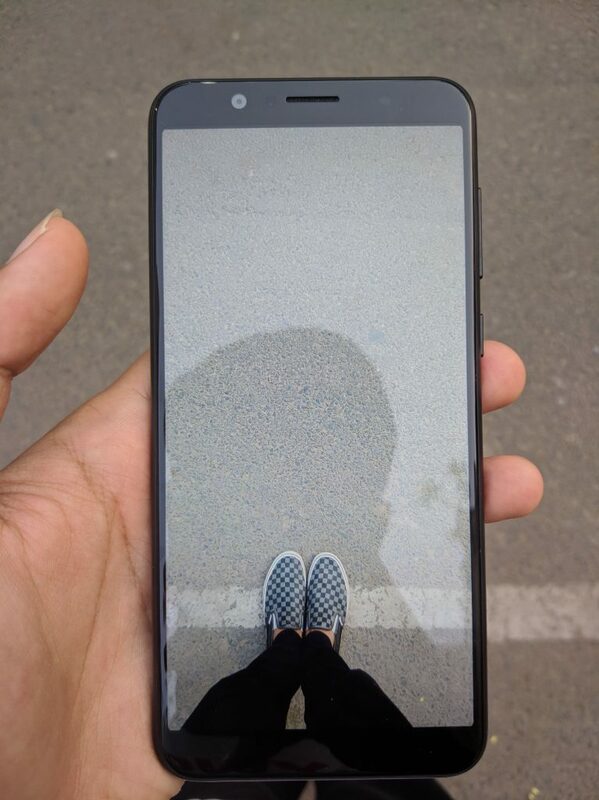 It has a Full HD display with an aspect ratio of 18:9, a screen size of 5.99 inch and a PPI of 402 on a 2.5D curved glass makes the display crisp and clear. The 5.99 inch is really good for media consumption but it ensures that you won’t be able to reach the corners with single hands use. The colours are on point and dynamic range is good. Asus states it has a contrast ratio of 1500:1 and claims 450nit maximum brightness, also the phone is pretty good for Outdoor use. The bezels are not the thinnest out there but, I would say they’re not way too thick as well! Overall, I wasn’t expecting the Screen department to be this good from Asus, it’s probably one of those things that I loved about it! Asus has definitely worked in the performance department of this phone! The device has near to stock Android which makes it’s performance better than other devices like Xiaomi Redmi Note 5 which does have the same Snapdragon 636 chipset, yet an OS like MIUI bottlenecks the performance out of it! The device rocks a Qualcomm Snapdragon 636 (octa-core) chipset, coupled with an Adreno 509 GPU and comes in 3 or 4 GB RAM options! To be honest, the device has a powerful hardware. What comes into the play is the software, which is well optimized. Max Pro M1 comes with an internal memory of 32/64GB and you get an option to expand storage to up to 2TB by using a memory card! Asus Max Pro M1 is really good at multi-tasking, the hardware and software pretty much helps all of it out to prevent any hiccups while using it. Asus M1 is probably one of those few devices that offer a 5000mAh battery, which is probably the reason why it has word Max in it. Due to the use of near-stock Android Oreo 8.1 which is well optimized, makes the device last at least a day’s usage even going through a heavy usage! The battery is definitely one of the best things about this phone! Asus has done a really great job by embedding in a 2nd generation NXP Amplifier into the device! If you happen to have a good pair of Headphones or Earphones, you would definitely love the audio output through this smartphone! It has a 5 Magnet speaker which is loud and good. The placement is a con as sometimes I find myself muffling up the speaker. It’s something that many reviews don’t really talk about. The calling experience through Max Pro M1 has been fantastic, you can feel the difference when you get a really good call reception compared to the one you had in previous device! 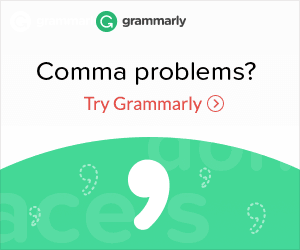 I’m in dilemma to describe this. I’m not a camera person. So, it also makes me not the best one to judge the camera clicks. Rear Camera is pretty tough to crack. (Cliche Pic) A failed attempt at getting a good close range shot, thanks to the well optimized focus! The colors are on point, the dynamic range is great (considering the price range) and HDR mode also works pretty decent. But it’s not really good at focusing objects at close range. Macro shots were tough to click, To be honest, I wasn’t even able to click one good macro shot. Portrait Mode : this is the point where the camera topples down. Considering clicking pictures of humans, the edge detection and depth effect doesn’t even seem to be present. A decent picture through the portrait mode! 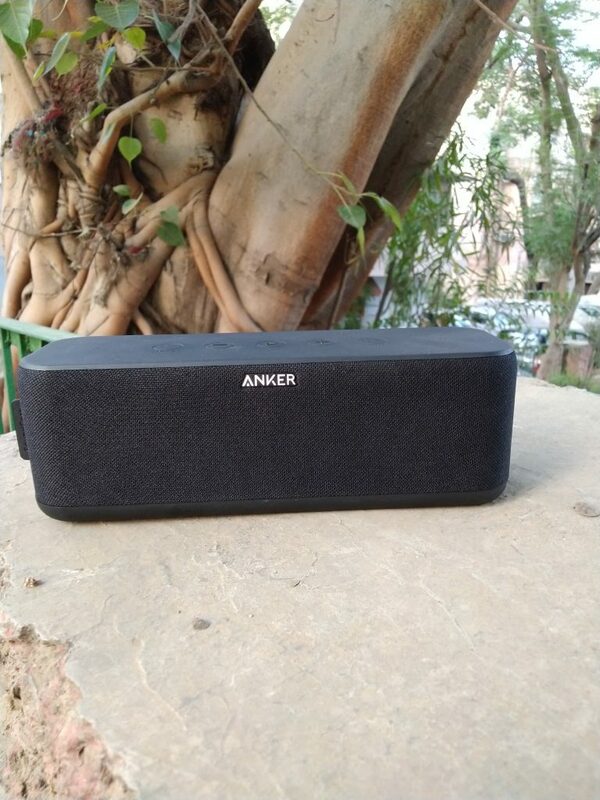 When taking objects like this Anker speaker, the camera somehow performs better than I expected. The front mesh texture of the speaker is sharply captured, the background is blurred in decent proportions. Also, I noticed how the color reproduction is on point with this device! I am not even planning to post any image of the front camera samples. The front camera is plain awful and you won’t even love using it. 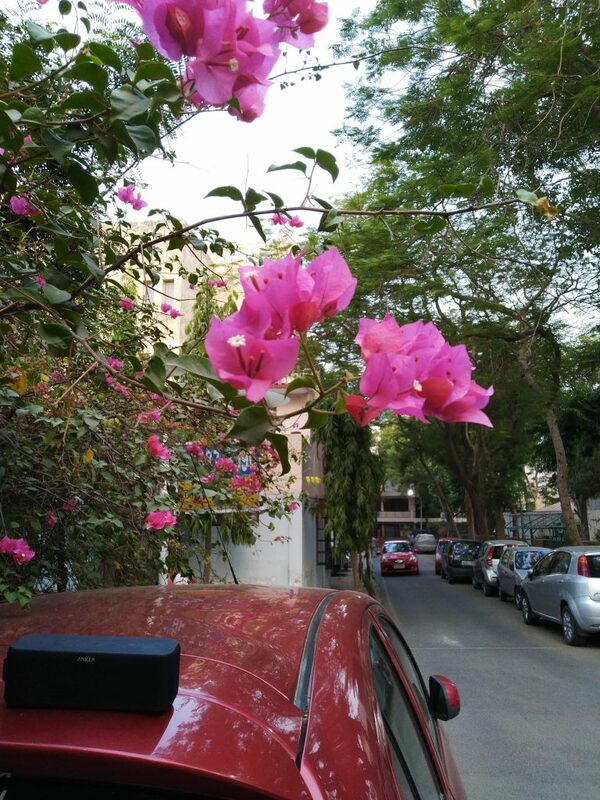 Overall, the rear camera of this phone is not too bad considering it’s price point. But, the front camera is a straight disappointment, I can rant about it for 500 more words which would conclude one thing, it could’ve been better. The fingerprint sensor on Asus Max Pro M1 is pretty average, nothing too fast and not too slow. It’s placed on the back which is not the most convenient location, but I guess Asus wanted to achieve that pseudo bezel-less phone look. So here comes the interesting part about Face Unlock. The day I put this on, I totally hated it. It just won’t unlock (even when I removed my glasses). From the next day, I was surprised when it automatically unlocked itself even when it wasn’t able to, just a day ago. Obviously there would be some Machine Learning going in through the data collection of my face features and stuff, but yeah, my thoughts are again, neutral about the face unlock. It’s average for performance, but great for the pricing! 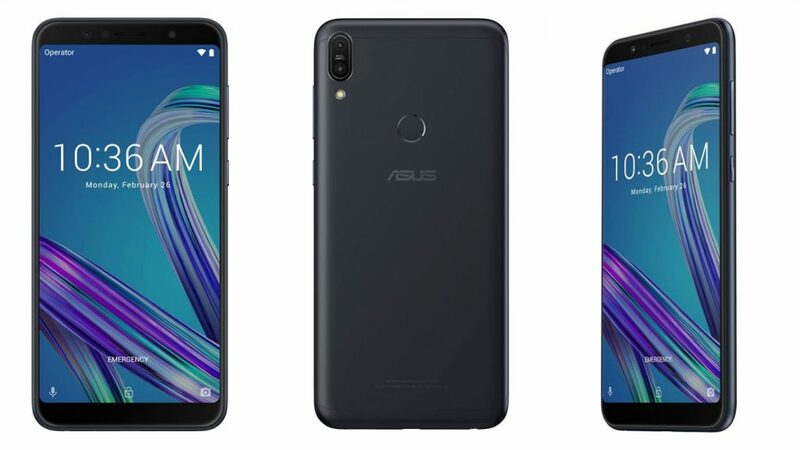 Asus Zenfone Max Pro M1 is a device that rightly targets the mid-tier budget of Indian audience by providing in all the latest specifications one would need at that budget, powered by Stock Android! Overall, this device is for someone who’s at a budget and his life doesn’t revolve around clicking picture. Disclaimer : The pictures used above have been compressed for faster website speed. Introduction to Mobile App Development and how to plan for it?